I recently read a review of one of my books where the reader felt duped in learning I was American, because my book sounded British. Now I admit I found this a little annoying. When writing a British book, I want to sound British. And just because I didn't grow up with it doesn't mean it isn't real. In fact, most Americans, if they met me, would think I sounded British. However... I do recognize that in writing I can't sound entirely British. Kindly readers have pointed out Americanisms to me that I never would have realized (or rather, realised). So it seems I can't win. I can't write an authentic British voice, and I can't write an authentic American voice, either. What, you say? But you ARE American! Of course you can write in an American voice! Dear reader, I cannot. I have spent twelve years in the UK. I had three out of five children here. I am SURROUNDED by people speaking in English (or Welsh!) accents, using English (or Welsh!) expressions. Two out of five of my children have British accents themselves. An authentic American voice is beyond me. So what ends up happening is I sound like a bit of both, and I don't know what to do about that. In fact, in writing my latest Willoughby Close books, I worried that I wouldn't sound British enough, because those irritating little American turns of phrase would slip in. And yet somehow I ended up sounding too British! I suppose I will always have to walk this line between America and England, for my whole life, so I ought to stop whinging--or rather, whining about it. According to the fascinating book Third Culture Kids, if you live in a country that is not of your parents' birth for more than two years, you cannot look upon your 'home' country as truly home any longer--and that is certainly true for me! But I suspect this type of polarity will be true for many as people move countries. So at least I am in good company, straddling two cultures--and two languages! Yes! This is me too! I'm English and have lived in American for over 10 years. Like you I think it's probably easier to write in the language of the country you currently live in but it can make it tricky sometimes. I got around it in my last book by saying the character had grown up in England and in my next book the heroine has an English mother. I tend, like you, to have some American characters and some English characters - we're bilingual! 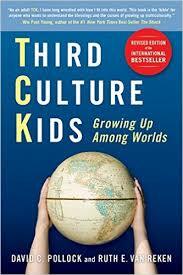 Thanks you for mentioning that book Third Culture Kids, I oils be interested in reading it. Also, for what it's worth, I think your books are excellent and you have to remember, you can't please everyone. Thank you Tina! I've long accepted that I can't please everyone, but this was a new criticism that made me scratch my head : I definitely recommend Third Culture Kids! If, as an American author, you've had a 'complaint' that your book sounds 'too British', I would take that as a HUGE compliment! I work with a number of books by American authors who set their stories in the UK, so I know how tough it is to have the resulting characters speak and behave authentically. 'Gotten' is an especially annoying word! That said, some of the authors I work with succeed very well. Some less so, although all but one have been very welcoming of comment from an actual Brit about their books!